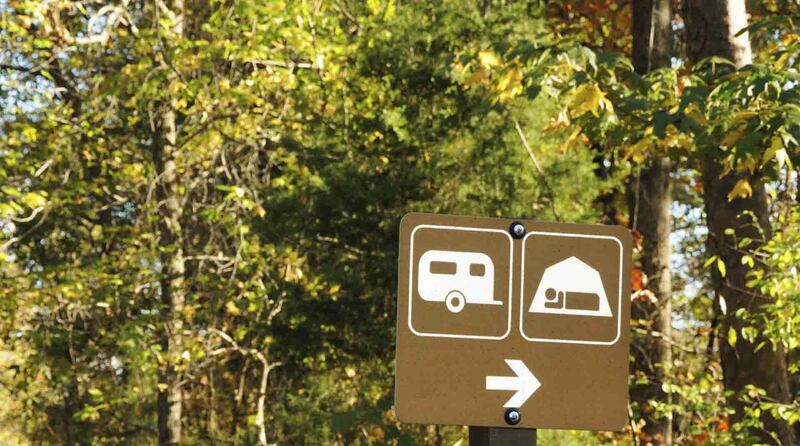 Looking for your next campground management software package? Looking for a solution that will GROW your business via increased occupancy and improved revenue? Want a product rich with features but still easy to use? Want a mobile device friendly system that can reach campers on the go? Our user-friendly cloud-based management software is the newest, most powerful and best value in the industry. 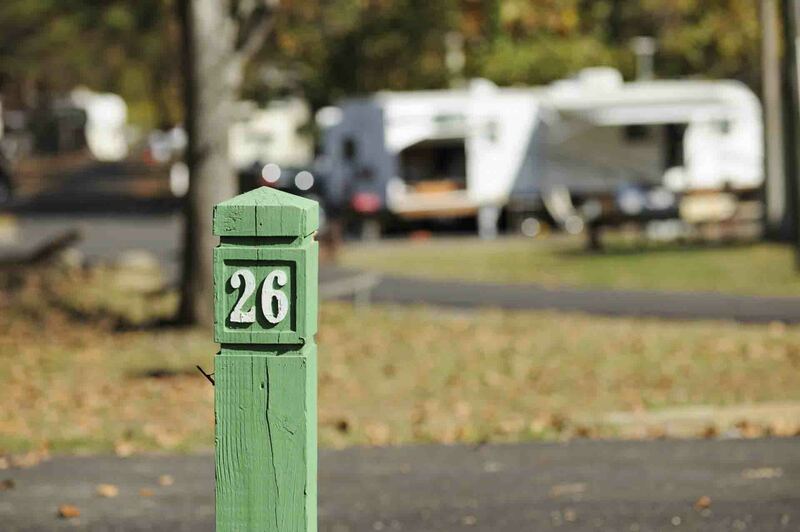 Managing your campground has never been easier with this premium all-in-one solution. Our pricing is based on the number of reservations that are made. That's it! Every feature included. Just to be clear, we do not charge based on the number of sites you have, how much data you are storing or a fixed monthly charge. You pay only for each site reservation. You don't pay for empty sites every month, you don't pay for cancellations or no-shows and you don't pay anything in your off-season. We don't charge extra for emails, text messages or payment transactions. Most importantly, we do not charge extra for supporting our product and helping you when you need it. This gives you the ability to easily estimate your overall cost for a reservation management system. Our pricing model aligns our business goal with your business goal - attract more customers and book more reservations. "Our online reservations have improved so drastically that we are truly amazed and grateful for the added influx of revenue." PCM is a complete system that provides you with unlimited users, unlimited sites, unlimited reservations, unlimited free upgrades……in other words, no limits! No limits on the number of reservations or customers. No limits on the size or length of storage. PCM can manage all of your sites. You can easily support 1000+ sites across multiple site maps if needed. Add as many users to the system as you need. Rest assured that they will only have the security access that you grant them. Send out confirmation emails and text messages to notify customers about changes in their reservations. You have full control of the branding of your notifications and attachments. 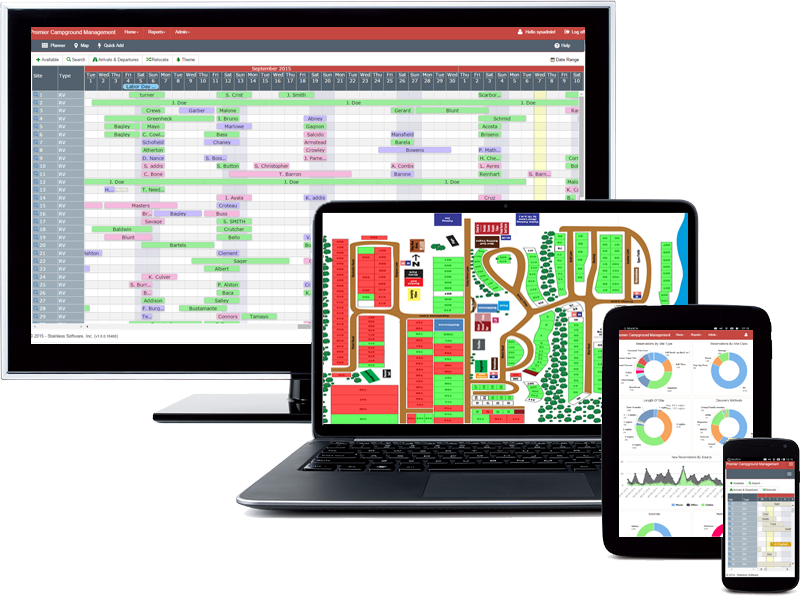 Automatically assign, track and manage housekeeping and other routine maintenance tasks with our powerful task workflow tools. Get real-time updates on task progress and instantly see when a site is ready for the next guest. Offer all of your add-on products and increase cross-sells to online customers. You are in control of all lists in PCM. Add as many as you need. Are we missing a field? Add one yourself! Add as many new fields as you need with our custom form field support. Don't worry about getting stuck with an obsolete system. PCM is always evolving and upgrades are always free. "PCM has been a very good investment for us." PCM is an easy to use cloud-based reservation system that allows you to manage your campsites with ease, control and efficiency. We offer an unrivaled combination of power and flexibility at an affordable price. 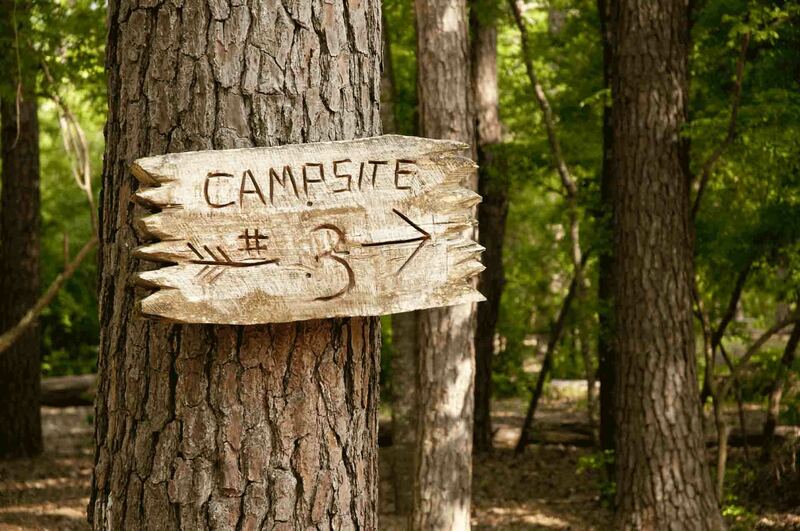 PCM was built from the ground up for use with mobile devices which have become the device of choice for guests requesting a campground reservation. You are in complete control of your rate structure with our flexible rate calculation engine. Set and adjust your rates using any reservation or customer attribute. 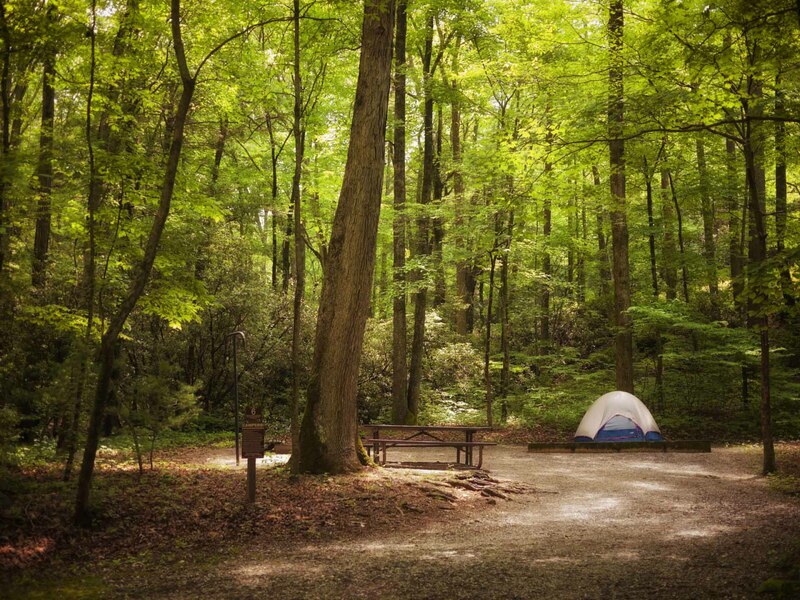 Manage your campground from anywhere. All you need is an internet connection. Accept online reservations from anywhere in the world. All reservation changes are immediately shown to every user - no browser refresh needed. This gives you an "at-a-glance" view of your entire site and prevents double bookings. 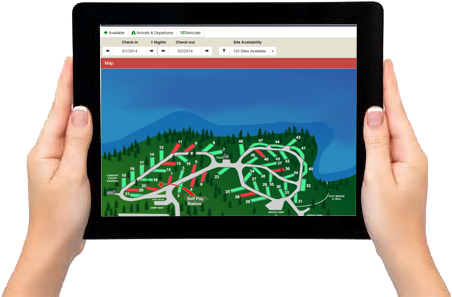 PCM can integrate your existing site map to give you a clear, familiar view of your reservations. 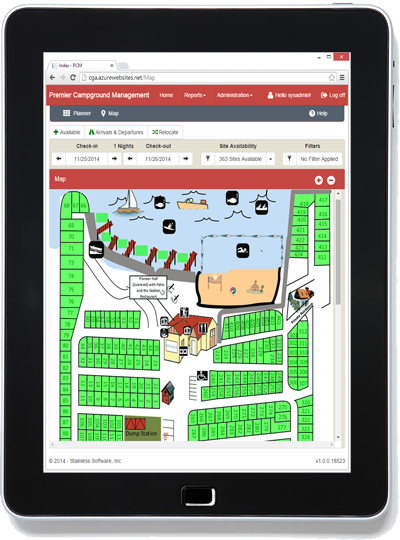 Multi site map support allows guests to find their site easily even for large RV resorts. Triple redundancy and geo-replicated database backups ensure all of your data is securely stored and never lost. PCI DSS compliant. 128-bit SSL encryption, full audit logging and more. 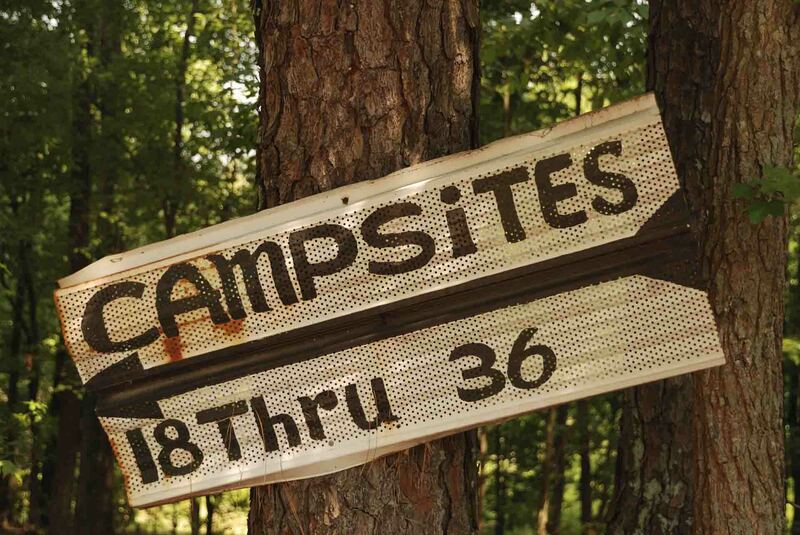 Our fully integrated POS system offers some incredibly useful features for campgrounds. 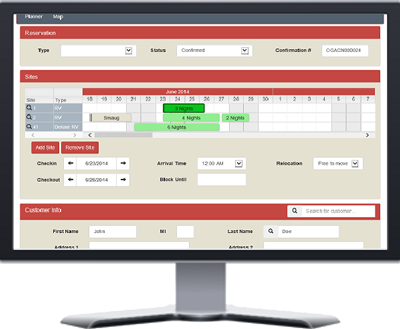 Manage merchandise sales and inventory easily with built-in features that let you record sales transactions, manage products and categories and even get notified by email when low on inventory. Can't find something? Don't waste time looking. All screens have full search capabilites built in. Are you a new user? Learn how to use the system quickly using the built-in guided tours. They will walk you through all the common tasks step by step. "Our customer data base for returns is at 85 percent. The ability for our customers to pick their favorite site is a luxury they have been begging to have for years." You are going to find tools and reports that are geared to giving you access to ALL of your data, not just the standard who is arriving, who is departing or what sites are available. These tools will provide you with meaningful insight into your business operations, help identify new strategies, increase efficiency and give you a major competitive advantage. PCM has a robust marketing tool that is quite unique to the industry. Want to market to former guests who have children? Want to make a special offer to repeat guests? Want to market to your former guests who have RV’s of a certain size to fill those openings on a holiday weekend? It’s a few quick and easy keystrokes to generate, send and track your email campaign. There's no need to use an external email marketing site, it's all available right here for no additional cost. How have reservations been trending for the past 3 months? How are customers finding my park? How far away do my customers live? What's my most popular site? How many repeat customers do I get? How many guests per reservation on average? What's the most popular day of the week or week of the year? 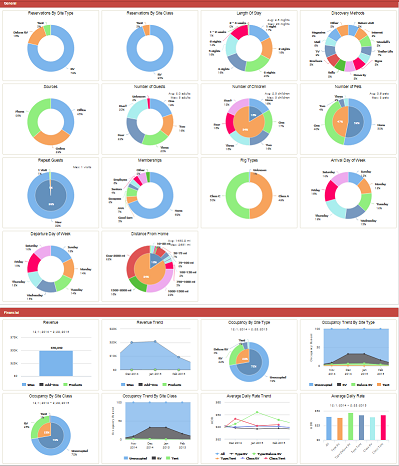 Quickly find these answers and more in our statistics reports. You own your data and you can download a fresh copy anytime in several different file formats. Retrieve your reservations, customers, sites and transactions quickly using PCM's built in export tools. You can even get a fresh copy of your reservation data sent to your email inbox every day just to be sure its always at hand. © 2019 - Stainless Software, Inc.